Anfalas is a primitive and poor land, in which the kings exert little direct influence. Its inhabitants lead simple, rural lives, usually centered around fishing, agriculture, or shepherding. It was located far away from the tumultuous events of the mid-Third Age. However, its mountains are rich in minerals, and its forests provide southern Gondor’s shipyards with timber and tar, making the territory and important possession. The Dúnedain have lived along the Langstrand since the middle of the Second Age. They were then mainly concentrated in some small settlements at the mouths of the Lefnui and Celgaen. The inland was for long time a wilderness into which no proud man ventured. Trade was negligible, and the Dúnedain accordingly showed only a minor interest in the land. Haven of Lond Galen was established in the 19th century of the Second Age by mariners, settlers and dissidents from Númenor. It was a member of the Pelargirean League, an association of independent Númenorean city-states and colonies under the leadership of Pelargir until its dissolution in III 754 and subsequent incorporation into the Kingdom of Gondor. After the conquest, there was a small, additional influx of Dúnedain, either as residents in the small towns, which were flowering under the peaceful royal rule, or as landowners, buying or receiving manors in the territory. Most of the region’s inhabitants belong to Gwathuirim tribe of Danan Lin who have who have lived there since the Second Age. For a long time, the small population consisted of hunters and fishermen living along the coast or in the river valleys. Slowly these spread into the highlands behind Ram Galen and, equally slowly, an agrarian society developed. However, the land was not rich, and the people lived under poor circumstances at best. The contacts with the Dúnedain provided an impulse for improvements, but it remained a backward land for a long time. 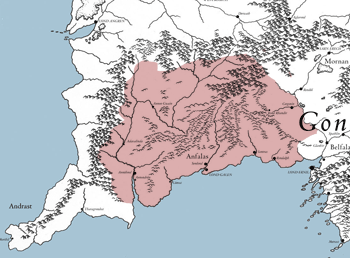 The influence of the Dúnedain did not reach far behind Ram Galen, and though the region’s incorporation into the realm in the eighth and ninth centuries of the Third Age improved the level of development, Anfalas remained one of the poorer areas of the kingdom. To the inhabitants of the Vale of Anduin, the name Anfalas signifies the entire northern coast of Belfalas Bay between the rivers Morthond and Lefnui. 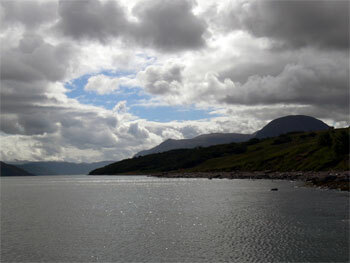 Usually, it does not include Mornan, which forms a small separate fief at the upper part of the River Morthond. On the other hand, the land of Andrast, west of the Lefnui, is often included, in which case Anfalas means the entire land west of the Morthond. Anfalas is not a single geographical unit, contrary to what might be assumed. It is geographically and politically subdivided into two areas: Anfalas proper and the Pinnath Gelin. These two are separated by the long ridge of Ram Galen, which runs parallel to the coast a short distance inland, nearly all the way between the Morthond and the Lefnui. Both are ruled by the Governor of Anfalas holding court at Lond Galen. There are nearly three hundred miles of coast between the mouth of the Morthond and the Lefnui estuary; but the area is only a thin sliver of land, since the distance between the coast and the northern border along the watershed atop the Ram Galen is seldom more than thirty miles. It is only in the west, where a large piece of land juts out into the sea, just to the east of the estuary of Lefnui, that the distance between the coast and the hills is noticeably greater. The entire area is low, flat coastland with many small creeks and streams running from Ram Galen to the sea. The land is rather water-logged with large fens and bogs, especially along the eastern parts of the coast. The western part is slightly richer agricultural area, but still quite underdeveloped when compared with the Vale of Anduin. There are also many fishing villages and small harbour-towns along the coast, wince the adjacent waters are rich fishing grounds. Also along the coast stand many brackish marshes from which salt may be conveniently and profitably extracted. The summers in Langstrand are the Cape of Andrast are usually rather warm, but since they are coastal regions, they receive a lost of rain. The winters are temperate and very rainy. It is rarely cold enough to bring snow, of tor the rivers and lakes to ice over.